The British Army’s Light Dragoons have arrived in Poland as part the UK commitment to NATO’s Enhanced Forward Presence in Eastern Europe, taking the total deployment in the region to nearly 1,000. Supporting the US led battle group in Poland, 150 UK personnel have travelled from their base in Catterick Garrison to arrive this week in Orzysz, Poland in Jackal and Coyote light reconnaissance vehicles. The regiment will be based in Poland for at least six months, when they will be replaced by another unit to carry on our enduring commitment to the region. 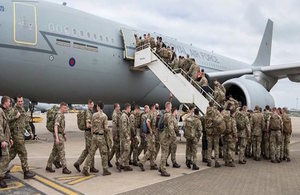 Meanwhile the arrival of the remaining UK personnel into Estonia this week, forming part of a nearly 800-strong British-led battle group, means nearly 1000 troops are providing deterrence in Eastern Europe. Soldiers from 5 Rifles battle group, based in Bulford, Wiltshire and The Queen’s Royal Hussars, based in Paderborn, Germany, have travelled to Estonia to work under the command of Lieutenant Colonel Mark Wilson. The commitments in the Baltic region will be augmented by the deployment of RAF Typhoon aircraft to Romania later this year, to carry out a NATO Air Policing mission in the Black Sea. The UK is stepping up its support for NATO’s collective defence through our deployments across the alliance. British personnel are playing a leading role in NATO: delivering deterrence and defence in Estonia and Poland and air policing in Romania underlines our commitment to the security of Europe. On Monday, Defence Minister Earl Howe, joined by His Excellency Mr Lauri Bambus, Estonian Ambassador, bade farewell to Estonia-bound personnel at RAF Brize Norton. The men and women of 5 Rifles have travelled to Estonia as a part of the biggest reinforcement of NATO’s collective defence in a generation, standing by our allies and working closely with forces from across the Alliance. 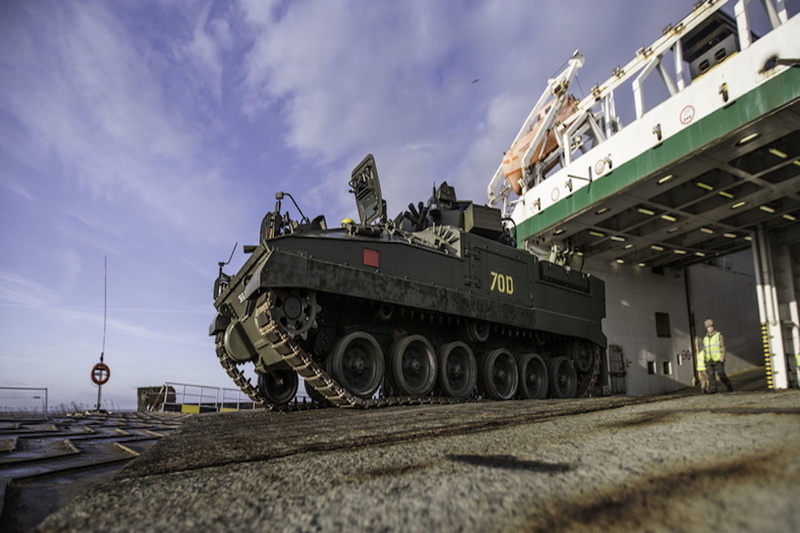 The final UK vehicles also departed Marchwood, UK last week, carrying nearly 200 vehicles including Warriors and Panthers vehicles. Last week also saw two trains carrying French vehicles arrive in Tapa, Estonia, supporting the UK-led battalion.